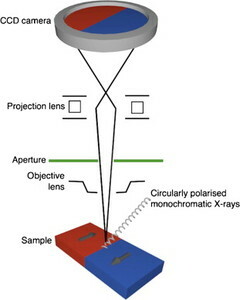 X-ray photoemission electron microscopy (XPEEM) enables natural remanent magnetisation to be imaged with ∼30 nm∼30 nm resolution across a field of view of 5–20 μm. The method is applied to structural features typical of the Widmanstätten microstructure (kamacite – tetrataenite rim – cloudy zone – plessite) in the Tazewell IIICD iron meteorite. Kamacite lamellae and the tetrataenite rim are multidomain, whereas plessite consists of laths of different phases displaying a range of stable magnetisation directions. The cloudy zone (CZ) displays a complex interlocking domain pattern resulting from nanoscale islands of tetrataenite with easy axes distributed along three possible crystallographic directions. Quantitative analysis of the coarse and intermediate CZ was achieved using a combination of image simulations and histogram profile matching. Remanence information was extracted from individual regions of interest ∼400 nm∼400 nm wide, demonstrating for the first time the capability of XPEEM to perform quantitative paleomagnetic analysis at sub-micron length scales. The three tetrataenite easy axis orientations occur with equal probability in the coarse and intermediate CZ, suggesting that spinodal decomposition in these regions was not strongly influenced by internal interaction fields, and that they are suitable candidates for future paleomagnetic studies. The fine CZ shows a strong dominance of one easy axis. This effect is attributed to island–island exchange interactions that render the fine CZ unsuitable for paleomagnetic study. Variations in the relative strength (proportion of dominant easy axis) and direction (direction of dominant easy axis) of a paleomagnetic field can be resolved from different regions of the CZ using XPEEM, raising the prospect of obtaining a time-resolved measurement of the active dynamo period in meteorites originating from the upper unmelted regions of differentiated asteroids (e.g. chondrites, pallasites, mesosiderites). Crown copyright © 2014 Published by Elsevier B.V. All rights reserved.